What in Kevin’s name is going on here? 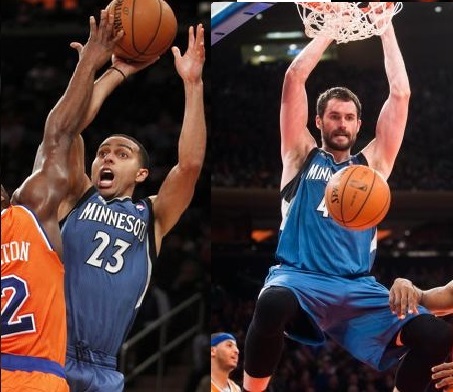 Kevin Love and Kevin Martin, two-fifths of the Minnesota Timberwolves’ starting lineup, scored 64 of the team’s 109 points in a nine-point victory at New York last night, giving the team a 3-0 start to the season. What was even more impressive from Martin and Love were the 64 points coming from only 31 field goal attempts, including Martin’s 30 points on only 12 shots party thanks to sinking all five of his three-point attempts. Ricky Rubio, Corey Brewer, and Nikola Pekovic round out the rest of Minnesota’s starting lineup that’s blitzed the opposition in the first halves of each of their first three games, outscoring opposing lineups by 34.3 points per 100 possessions, according to NBA.com. For the most part, they were responsible last night for putting the Knicks in a 21-point hole after the first quarter. When taking the last 24 minutes of the game into account though, the scoring of Minnesota’s starting unit takes a steep drop thanks to sloppiness we saw against the Knicks who, down 15 to start the fourth quarter, got within two with 4:48 left. That’s when the two Kevins carried the Wolves offense from there, scoring eight of the last nine points and 24 of the last 27. That two-man combination, along with the Love-Rubio duo, has all sorts of potential as a versatile one-two bunch to give defenders problems all season. There’s one set I’ve noticed over the first three games though that’s especially intriguing when involving specifically Love and Martin. Love, a step above either elbow, will get the ball from Martin and have the opportunity to hand the ball back as Martin goes around him and to the baseline. Handing it off gives Martin a good look at a baseline jumper or Love can wait a little longer and allow him to post up, particularly against a smaller guard like last night when he was effective against Raymond Felton. This all happens with an entire side of the court initially spaced out for just those two to operate. But Love can also fake the handoff to Martin and take a dribble behind the arc for a shot of his own. If that isn’t there –and if a pump faked three by Love somehow fails to draw a defender in the air– Pekovic will come sweeping across the lane, like in a few other plays that run through Love, for a post up near the rim. Letting Love operate above either elbow has been a staple in the Wolves offense since Rick Adelman came to Minnesota. The last two seasons had Luke Ridnour, given his effectiveness with shots along the baseline, as the guy best for working off him (in my couch potato opinion). There’s also been variations to the play over the years such as a guard setting a pick on Love’s defender, allowing a cleaner look at a Love step-back three-point attempt, or Love setting a screen and allowing a Wolves guard to dribble into a mid-range jumper. Let’s see how that all works with Martin now, who was due last night for some solid shooting after going 10-of-30 from the field in the first two games. For Love (29.7 points, 14.7 rebounds, 13 free throw attempts per game), it looks like he’s back to his pre-2013 self, the one that made Second Team All-NBA as a 23-year-old. Having that version for an entire season should put Minnesota back in the playoffs.